Daimler's Dieter Zetsche: Last month was Mercedes' best month ever. PARIS -- Daimler AG CEO Dieter Zetsche expects "moderate and continued growth and then a kind of stabilizing" for the world economy. He is "a little disappointed" with the U.S. market, which originally was forecast to generate sales of 11.5 million to 12 million vehicles in 2010. 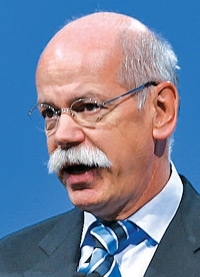 "We would be happy if it reached 11.5 million -- and it is almost all fleet," Zetsche said. Mercedes-Benz does not sell to fleets, and its U.S. sales are up 17 percent year to date, he said. In fact, the global luxury market is strong, Zetsche said. Mercedes-Benz's September sales worldwide would be the best in a single month -- ever, he said. "The market developed better than anyone would have expected, and that is true for the premium markets where we as Mercedes-Benz have clearly gained market share on a global basis," Zetsche said here at the show last week during a roundtable with reporters. "We have benefited from this tailwind." In other news, Zetsche confirmed that Daimler AG has been talking about using hybrid technology from Toyota Motor Corp. but denied that a deal is imminent. He said the two companies are "just testing the water. Our priority is Renault-Nissan." Daimler and Renault-Nissan have agreed to cooperate on the next generation of the Renault Twingo and the next-generation Smart cars.